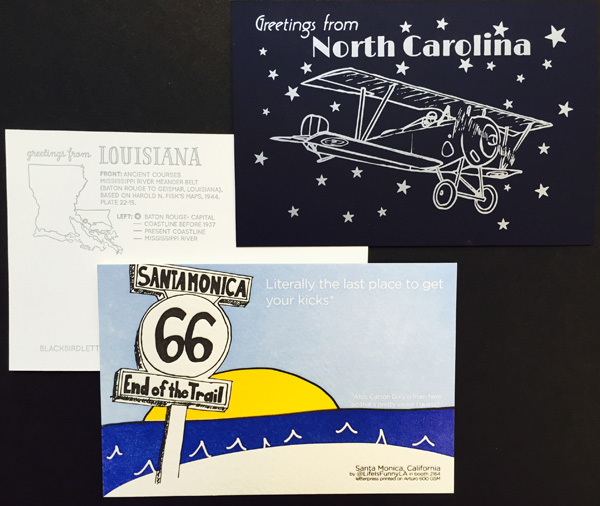 National Stationery Show Scavenger Hunt Kicks off Tomorrow! The National Stationery Show begins tomorrow, May 17th. Stop by any of the exhibiting booths for a checklist to begin the search! Once you have successfully visited and collected the designers post cards, head over to the Legion booth (#2774) to stash your cards away and collect the post cards of the participants that couldn't make it to the show this year. Greeting from: Lady Pilot Letterpress from North Carolina using Plike, Blackbird Letterpress from Louisiana using Savoy, and Life is Funny Press from Sant Monica using Arturo.